Sunday morning, we decided to venture out to a local farmer's market loacated in Jack London Square. Considering it only takes 5 minutes by walking and that we've been living in the neighborhood for more than 3 months, we felt it's time to get to know our community a little better. Frankly, we had very low expectations for the farmers' market in Jack London Square, for the area has lost much foot traffic over the past few years and seem to have dwindled to a lost zone in the neighborhood. To our surprise, in JLS we found a row of white tents under which fresh, delicious-looking colorful vegetables, fruits and breads were on display. The fresh breeze over the bay was also in the air. Even better, most sellers offered samples - be oranges, apples, strawberries, bread, dips, popcorn, dried fruits, nuts and what have you. It sure was a delicious place to be. These baby potatoes do come from there. It makes a perfect snack for Sunday afternoon. 1. Boil the potatoes for 10 minutes. Add salt to water when cooking. 2. 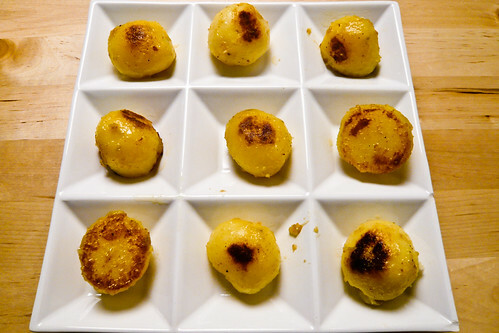 Bring the potatoes to a frying pan glazed with olive oil. 3. Cook them until they turn golden brown. I like it a little crusty and dark brown. 5. Grate Parmesan cheese over the potatoes. Tip: Sprinkle with chopped basil or rosemary for more flavor.